NEW DELHI — India signed a $5 billion deal to buy five Russian S-400 air defense systems on Friday despite a looming threat of U.S. sanctions on countries that trade with Russia’s defense and intelligence sectors. India has requested that the U.S. grant it a waiver for the deal from sanctions prescribed by the Countering America’s Adversaries Through Sanctions Act, a U.S. law passed in August 2017 that is intended to punish Russia for its annexation of Crimea and alleged interference in the 2016 U.S. elections. Vladimir Sotnikov, a foreign affairs expert at an independent research institute in Moscow, believes India could make the payment in a mixture of rupees and dollars to try to circumvent the sanctions. The National Security Council at the White House said in a statement that the Trump administration urges all “of our allies and partners to forgo transactions with Russia that would trigger sanctions” under the act, known as CAATSA. 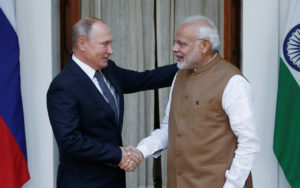 The deal will likely bolster the close relationship between India and Russia that dates back to the Cold War, when the U.S. tilted toward Pakistan, India’s neighbor and archrival. But it is also likely to strain ties with Washington. The deal will likely bolster India and Russia’s relationship that dates back to the Cold War. Associated Press writer Deb Riechmann in Washington, DC, contributed to this report.